If the absurd, Viper-smoking performance of the Tesla Model S isn't enough to convince you that Elon Musk's company is serious about speed, perhaps this bit of news will. 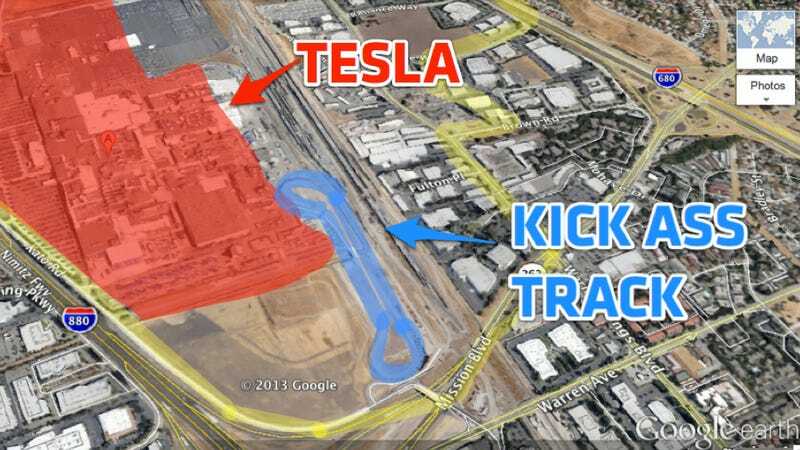 Tesla Motors this week purchased a 35-acre plot of land near their factory that includes a test track. The Silicon Valley Business Journal reports that the Fremont, Calif. land deal gives Tesla "more room to vroom" because it includes more than half of a road test track previously owned by NUMMI, the joint venture between General Motors and Toyotas that for years cranked out Corollas, Pontiac Vibes, Geo Prizms and the like. These days, that plant is owned by Tesla — it's where they manufacture their own cars. The property is located south of the Tesla plant, near the intersection of Mission Boulevard and the Union Pacific rail line, according to the Journal. Tesla hasn't said how much they paid for it. It's awesome that Tesla has their own track, which is a vital testing tool for any automaker. It's also great to see them continue to pump new life into the former NUMMI site. Anyone care to go over there and get some spy shots of future Teslas being whipped around the course?